Warren is founder of the Saddleback Church. 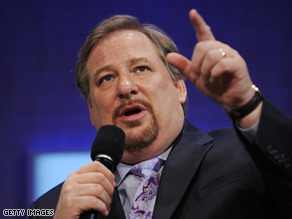 (CNN) - Prominent liberal groups and gay rights proponents criticized President-elect Barack Obama Wednesday for choosing evangelical pastor Rick Warren to deliver the invocation at the presidential inauguration next month. Warren, one of the most powerful religious leaders in the nation, has championed issues such as calling for the reduction of global poverty, human rights abuses, and the AIDS epidemic. But the founder of the Saddleback Church in Lake Forest, California, has also adhered to socially conservative stances - including his opposition to gay marriage and abortion rights that puts him at odds with many in the Democratic Party, especially the party's most liberal wing. People for the American Way President Kathryn Kolbert told CNN she is "deeply disappointed" with the choice of Warren, and said the powerful platform at the inauguration should instead have been given to someone who is "consistent mainstream American values. "The president-elect certainly disagrees with him on [Lesbian, Gay, Bisexual, Transgender] issues. But it has always been his goal to find common ground with people with whom you may disagree on some issues." Quote, "Wow, this is truly shocking. First Obama names an almost entirely male cabinet. Now he stabs the gay community in the back." Well I guess Hillary Clinton, Susan Rice, Gov. Napolitano, all don't count as women!! Hope you have your bags packed already. Obama is the most tolerant president in this lifetime, and yes, even over Clinton. One thing you disagree with and you want to leave the country? Hate to break it to you baby but Obama isn't going to pick a leader based completely on gay/lesibian issues- there are many other factors involved. I'm all for gay/lesbian rights but like Independent Fred said, the majority of the country doesn't see this as a big deal. Just be happy Obama doesn't completely try to amend the Constitution and dissolve civil unions; just think, it could be worse? i am liberal on certain issues and conservative on others. In essence my political views are confused. I don't see what the issue is with this. First according to the constitution (the highest law) we have the right to express any religious beliefs we see fit. I don't care what religion this man preaches. What would everyone do if this man was a Rabbi giving an invocation at the inauguration? an Imam? and the aethists out there you have to believe in something otherwise the essence of religion is gone. Secondly the legal definition of marriage makes a gay/lesbian marriage hard. The reasoning is it is a legal contract to reproduce. Plain and simple. So it is not for us to deciede what is right and wrong. We are all instilled with some values in our lives. Yet with the country in turmoil and the economy crumbling everyone is crying because an evangelical is giving an invocation? Who would everyone want? Rev Wright? Imagine that firestorm. Finally I am very liberal on social issues. Yet I have no qualms with this at all. I mean I work for a company where the owner thinks Bush and all the neo-Cons are the best thing since sliced bread. We can work together and I am and always have been staunchly against Bush. Come On people think with Logic and Reason and not emotion. It is extremely disappointing for the African American president elect, who got a tremendous amount of support from the gay community, and who marginally opposed proposition 8, and other hatefull discriminatory legislation, to now pick a religious leader who further promotes anti gay sentiment to "bless" his presidency. Our support of his candidacy already cost us losses for our civil rights. Now he further alienates himself from our civil rights cause by accepting the religious bigot as part of his celebration. Gay people will not be celebrating as wholeheartedly as we would have liked to have been, had he truly stood for civil rights that as an African American he somehow now feels he has accomplished. He is leaving gay people in the dust of his ride to the white house. Shame on him. Inclusiveness should not mean capitulation to those who deny civil rights to all Americans. There are PLENTY of true christians he could have picked who don't have a history of comparing the protection of basic privacies for homosexual families to encouraging pedophilia and beastiality. I am shocked and appalled at this choice of a hate monger to give an invocation that should be about inclusion and acceptance. AND NO, pointing out someone's active attacks of an entire group of our citizens is not "intolerance." That's like calling someone intolerant for not wanting to hear Hitler speak. Suggesting that everyone needs to embrace every ideology of hate in order to be "tolerant" of different views is idiotic. Your hate and despise for your fellow americans is unhealthy and unpatriotic. You really need to learn some tolerance. I lean rather far to the left, but I applaud Obama's choice. I see exactly what he's doing. He wants us ALL to share in this political rebirth of our nation. The left and right must come together. Obama doesn't care about LGBT people. Period. End of story. This has always been the case, will always be the case. Wake up people, you were all duped! I feel like I have just been kicked in the stomach. This is change we can believe in? Obama has betrayed me and millions of others gays and lesbians throughout this country. I hope we gather at the inauguration and make our voices heard - we must drown out these fundamentalist extremists bigots gunning for us and demand our civil rights! I didn' t vote for Obama, but I'm starting to like him more and more as I see how he's able to piss off the hard left. Tell me why churches dont have to pay taxes?Anyone?Please. How very disappointed that our leader would choose someone that is filled with so much hate against those that don't fit his narrow views. I'm really disappointed on Obama for so quickly forgetting the people that stood beside him and helped him get into office. So much for change...as usually we at the bottom only get short changed. Pastor Warren will be performing the invocation at the January 20, 2009 Presidential Inauguration. End of story. Anyone who is angered by this needs to take some time and think about it. This country is a lot better off when people work together on things they agree on in spite of other issues in which they disgree.... that's what will fix this country. If you refuse to work with someone on ANYthing b/c you dont agree with them on SOME things, you will miss opportunities to make things better...when politicians do it, it hurts this country. IF this is a sign of how Obama will run this country, then I promise you things will only be better in years to come. Liberals (and I am one) preach tolerance of those with different beliefs, and what could be better than tolerance by the President. I find it amusing all the gay activists on this page claiming that Obama owes his victory to them. Please tell us which states Obama would have lost without the gay vote? California? Hmmm, don't think so. How about Virginia? Hmm, nope. Get over yourselves. You have no ability to affect presidential elections. Get a grip people! It's not like Warren is running the country or taking over your life! It's just the invocation.....a prayer that will only take a minute or two. That's it. Many of you that are griping are not even going to the inauguration....and you probably won't look at it on tv either. He will be there for 4 years, we will not all agree on everything that he does....so just chill!...Please! Rick Warren represents the TRUTH of GODs WORD (The Bible). Gays are sinners just like the rest of us. GOD loves the sinners, but hates the sin. JESUS died for our sin, but does not mean we should go on sinning. GOD called Rick Warren to teach the TRUTH. If people don't like like TRUTH, they should take it up with GOD and not Rick Warren. Keep in mind, GOD wins every time. Ask GOD to help you understand and he'll set you free. He set me free 12 years ago and I'll never be the same. SEEK GOD and you will find his love, forgiveness and TRUTH. JESUS is the greatest GIFT. Merry Christmas. I'm an Obama supporter, and I also support all forms of marriage...of legal age. But in all honesty, gay and lesbians right to marry, SHOULD be at the bottom of the list of priorities, right there alongside my marriage, when it comes to leading this nation and getting us out of the mess we are in. No offense intended, but we really need to get over ourselves and look at the big picture when it comes to our nation. Let your local politicians, from state on down, worry about your right to marry. I still love Obama. Stop freaking out people. The pudgy bible-thumper will slink back to his snake-handling friends after Jan. 20 and we'll all get over it. This is not a statement by Obama to the GLBT community . . . The inclusion of Warren at this historic inauguration says volumes about who Obama REALLY is, and I am extremely disturbed by it!! Warren is a hateful bigot whose presence is inappropriate for a function that is meant to include ALL Americans, including the gays that Warren despises. There are plenty of other religious figures that could have been asked (and I do not agree that religion SHOULD be a part of this ceremony!!) so the only reason that is possible is that Obama is now pandering to the religious right. That frightens me since we have seen how Nazi-like many of the neocons can be during the Bush administration. My opinion of Obama has changed DRASTICALLY with this unfortunate and divisive choice. Thank you Jesus! There is some hope for this country and this presidency after all. TO BILL CHRISTIAN....WE NEED MORE PEOPLE LIKE YOU ON THIS PAGE..TO YOUR COMMENT;AMEN ! AMEN !